The recent commemorations of Victory Day in Europe – the 70th anniversary of the end of the second world war in Europe – got me thinking about how we refer to Germany as the perpetrator of the horrors in that war. Often we more correctly use the term “Nazi Germany” – but still it must place a burden of guilt on many Germans who were, and are innocent. On the other hand, it seems to me, it almost ignores the very real responsibility of people from other nations for these atrocities. (Although, granted some speakers will also refer to involvement of collaborators). Many years ago I visited the war memorial at Khatyn, in Belarus. This was a very moving experience because it symbolised how that nation had lost a quarter of its population during the war. All the residents of this village had been herded into barns which were then set alight – anyone attempting to escape was shot. The photo above shows part of the memorial depicting the man who was thought to be the sole survivor. Khatyn or Chatyń (Belarusian and Russian: Хаты́нь, pronounced [xɐˈtɨnʲ]) was a village of 26 houses and 156 inhabitants in Belarus, in Lahoysk Raion, Minsk Region, 50 km away from Minsk. On 22 March 1943, the entire population of the village was massacred by the 118th Schutzmannschaft Nazi battalion. The battalion was formed in July 1942 in Kiev and was made up mostly of Ukrainian nationalist collaborators from Western Ukraine, Hiwis and the DirlewangerWaffen-SS special battalion. The massacre was not an unusual incident in Belarus during World War II. At least 5,295 Belarusian settlements were burned and destroyed by the Nazis, and often all their inhabitants were killed (some amounting up to 1,500 victims) as a punishment for collaboration with partisans. 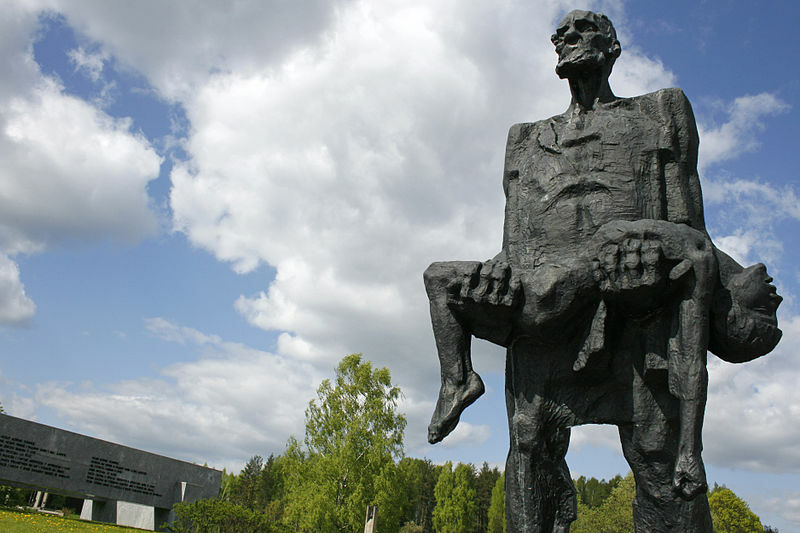 Khatyn became a symbol of all those villages. In the Vitebsk region, 243 villages were burned down twice, 83 villages three times, and 22 villages were burned down four or more times. In the Minsk region, 92 villages were burned down twice, 40 villages three times, nine villages four times, and six villages five or more times. Altogether, over 2,000,000 people were killed in Belarus during the three years of Nazi occupation, almost a quarter of the country’s population. It’s worth following up some of the links for more details. The Ukrainian Auxiliary Police, which included the Schutzmannschaft Nazis involved in this and many other massacres, carried out anti-Jewish and anti-partisan operations in most areas of Ukraine. While these units were formed directly after the German invasion of the USSR in 1941 Ukrainian nationalist organisations existed before that invasion. These extremist organisations were not just “nationalist,” but were racist – expressing hatred for Poles, Jews and above all, Russians. And these three groups became their victims during the war. “The commander of one of the platoons of 118th Schutzmannschaft Battalion, Ukrainian Vasyl Meleshko, was tried in a Soviet court and executed in 1975. The Chief of Staff of 118th Schutzmannschaft Battalion, Ukrainian Grigory Vassiura, was tried in Minsk in 1986 and found guilty of all his crimes. He was sentenced to death by the verdict of the military tribunal of the Belorussian military district. So the message is – when your hear about Nazi atrocities the perpetrators were not necessarily German. We should not forget the role played by collaborators and non-German nationalists in the Holocaust and other atrocities. And this is not an abstract appeal. Today the inheritors of the Ukrainian nationalist organisations which committed these atrocities are alive and very active in Ukraine. They even have military battalions fighting in the current civil war. 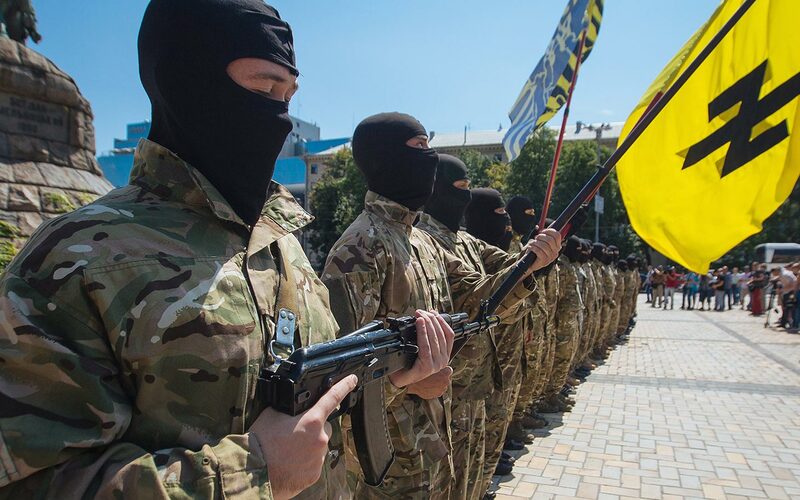 Worse, the US has now sent their own troops into Ukraine to train National Guard battalions which include units like the Azov Batallion which is based on extreme National Socialist ideology.